Termination of VoIP traffic in Libya can be a promising start-up in the telecommunications sector. With a population of 6.4 million people, the penetration rate of cellular communication is more than 155% here. The originators are ready to pay the terminator up to $0.08 for every minute of the terminated traffic. To make good money, you need to choose the optimal tariff plan. In Libya, there are 2 major GSM operators - Lybyana and Almadar. Almadar's subscriber base consists of over 3 million people, and this is about half of the local population. Therefore, SIM-cards of this operator are quite suitable for profitable voice termination. The cost of one SIM card in the country is about $3.5. If you protect the cards from blocking by AntiFraud systems, it will last three days, on average. 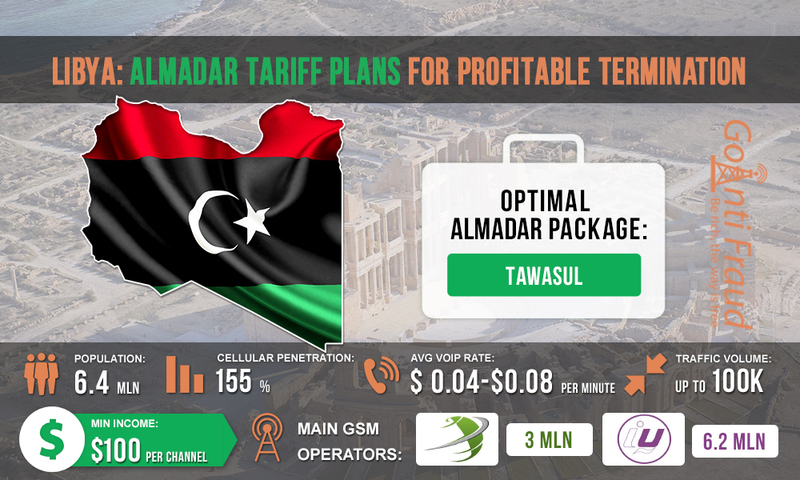 Almadar offers its customers one prepaid package – Tawasul that allows making on-net calls at $0.06 a minute. With the rate varying from $ 0.05 to $ 0.08, this tariff is not very profitable. But Almadar has a special offer - Friday Offer, which is available on Fridays only. For $ 2.15 you get an opportunity to make free on-net calls during the day. If you terminate 300 minutes a day, then the minute of conversation will cost as little as $0.007. Using the prepaid Tawasu package from Almadarl, by connecting Friday Offer, you will be able to make about 100-150 dollars (only from one equipment channel). By placing a dinstar dag 1000 or other gateways that have numerous ports, you can significantly increase your earnings. To get a stable high profit, use GoAntiFraud tools that will efficiently mask SIM-cards from antifraud systems.